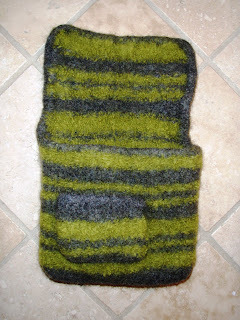 Kyle Knits - a boy, his cats and way too much yarn: Felted Bag - Experience Counts! Felted Bag - Experience Counts! I made this bag out of patons wool (the grey) and lion brand (the lime) and did it with a single strand of yarn - the pattern was from knitty.com - actually I have made almost 3 now - but this one I had assembled the pocket onto it, and have yet to sew on the strap - anyway, I was felting it last night in hot hot hot water and kind of left it alone, and let it run the entire cycle - and wow did it shrink! I still love it - I just named it a handbag instead of a messenger bag :) - and I learned my lesson with this smaller bag. I promise promise promise that I will pay attention to my knitting when I am felting it from now on! I now realize that when they say it'll keep shrinking, it'll REALLY keep shrinking!